Ringmat Developments have been researching the design of multi-strand cables for many years. The urgency to find the right cables increased with the design of our other Ringmat and Statmat products, as we felt that existing cables, made by other manufacturers, did not provide the level of performance required for our products to perform at their optimum level. 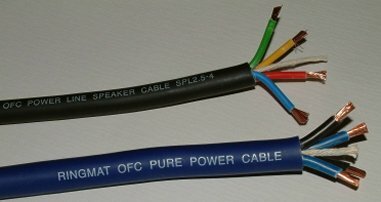 When using other manufacturers’ cables, far too many phase errors were creeping into the signal during transmission of the signal from source to speakers. The concept and design of the Ringmat Pure Signal Cable and the Ringmat OFC Pure Power Cable are the fruits of this endeavour. Both cables are exceptional at maintaining signal phase coherence. Ideally, they should be used with as many other Ringmat and Statmat products as possible, as this ensures that phase coherence in the signal is retained from source and throughout the sound (and picture) reproduction system.